Jeremiah 29:11 ' For I know the plans I have for you says the Lord'. 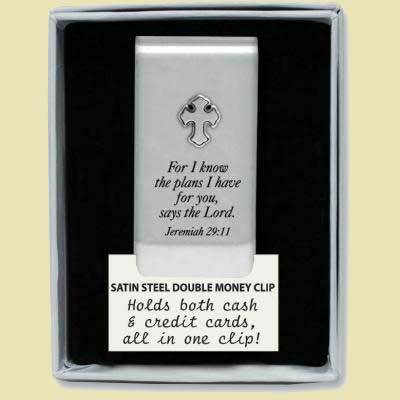 This lovely satin steel money clip has the Scripture and a Cross cast into the metal. Give that special man a satin steel money clip with scripture engraved on it. Every time he reaches for his money, he'll be reminded of God's mighty power.